Dubai, UAE, October 29, 2018: The Fred Hollows Foundation, based at International Humanitarian City (IHC) in Dubai, has launched its first UAE campaign calling for funds to help restore sight to the more than 15 million people who are blind across Middle East, North Africa and South Asia. 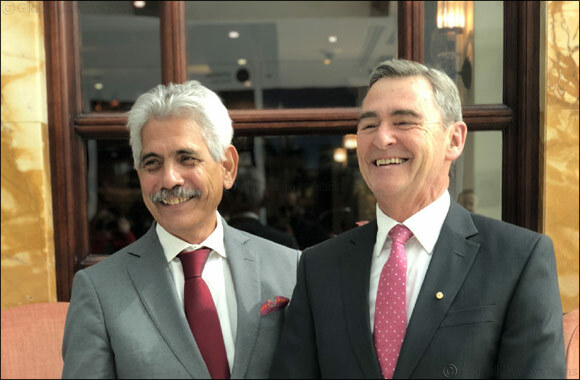 Chairman of The Foundation, the Honourable John Brumby said tackling avoidable blindness was a major challenge in the Middle East, South Asia and North Africa. “There are 15 million people in the region who are blind, but four out of five of them do not need to be. They are simply too poor to have their eye problems fixed or to access eye health services,” he said. The UAE campaign will also assist Rohingya refugees living in camps in Bangladesh. The Foundation recently discovered that up to 50,000 Rohingya refugees in Bangladesh camps were blind from cataract, which can be easily treated with a simple operation. “The Rohingya have never been able to access any type of doctor before. Fleeing from violence while also being blind is unimaginable. The UAE, through the IHC, has shown great leadership to help alleviate the suffering faced by Rohingya people. We hope this fundraising appeal will also give them a new life through the gift of sight,” Mr Brumby said. CEO of International Humanitarian City, Giuseppe Saba said he was pleased to assist The Fred Hollows Foundation with their work and to build lasting relations with partners in the UAE. “The IHC exists to support the humanitarian community in responding to emergencies and facilitating long-term development across the world,” he said. The Foundation decided to establish an office in IHC in 2017, attracted by the leadership commitment of His Highness Sheikh Mohammed Bin Rashid Al Maktoum, Vice-President and Prime Minister of the UAE and Ruler of Dubai, Her Royal Highness Princess Haya Bint Al Hussein, and the IHC Board to create an international humanitarian hub in the region. The Foundation is restoring sight in 25 countries around the world, including Bangladesh, Pakistan, Nepal and Ethiopia.